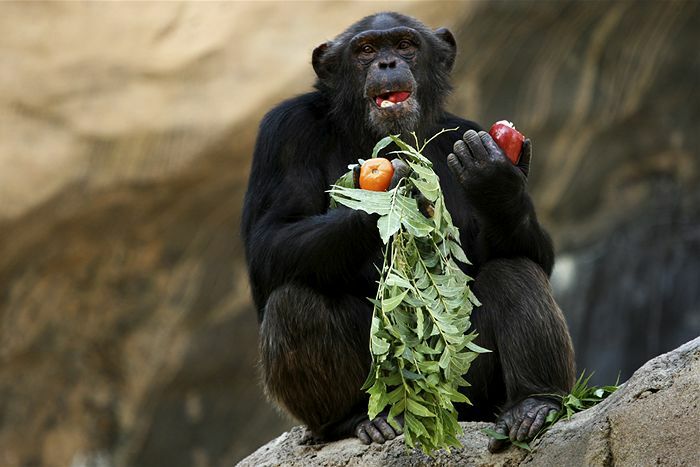 Chimpanzees specifically refer to favourite foods with distinct grunts, but the calls differ between populations, according to a new study. The chimps could then learn the “foreign” grunts, making communication easier when two groups merge into one. The findings, reported in the latest issue of the journal Current Biology, show that, like human words, chimp food calls are not fixed in their structure. When exposed to a new group, chimps can change their calls to sound more like their group mates. A big topic of conversation is food. 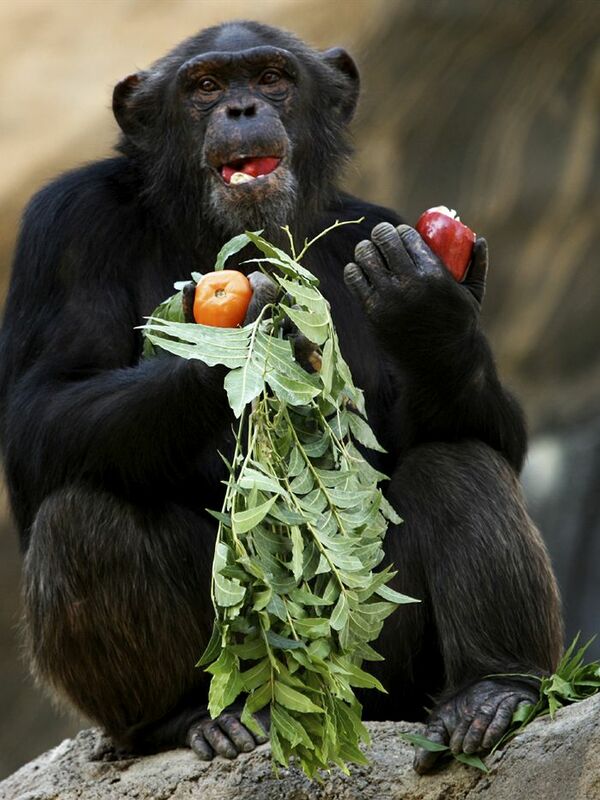 “Chimpanzees produce acoustically distinct grunts in response to foods of low, medium or high quality, and in captivity they give distinct grunts for certain foods, including bananas, bread and mango,” says study co-author Katie Slocombe of the University of York. Slocombe and colleagues studied what happened after two separate groups of adult chimps moved in together at the Edinburgh Zoo. Before the merger, the groups produced their particular food grunts. After the merger, the “newcomer” group significantly changed their calls to match those of the long-term residents, says lead author Stuart Watson, also from the University of York. The researchers offer a number of possible explanations. One is that the chimps might learn the “foreign” grunts in order to form, maintain or improve their social relationships with members of the different group. “If one was to make an analogy with human language, it could be the process of dialect change when people move between groups of speakers of the same language and subtly modify their accents to sound like the group into which they are moving, potentially as a way to aid social integration,” says co-author Simon Townsend of the University of Zurich. He adds that the chimps might also modify their grunts to ensure that the other chimps understand them correctly. The researchers, however, do not use the word “language” when referring to chimp calls. While studies continue to find similarities between human language and the communication systems of other animals, the scientists say that language is much more complex than just referring to objects in the environment with vocalizations. Townsend, for example, mentions that human language is “syntactic,” meaning that we can combine meaningful, referential words together into larger, higher-order structures, i.e. sentences, paragraphs and so on. We can also talk about objects, individuals and events in the absence of them since the words are fully symbolic. “We can even create a new word if we feel like it, something that chimpanzees are seemingly unable to do,” Watson says. Nevertheless, other studies on animals find that many, from birds to dolphins, have very complex communication systems that involve skills we don’t possess, such as the ability to share information via natural sonar. In the case of chimps, they are better than humans at naturally producing calls that carry over long distances, demonstrating that environmental conditions help to shape a particular animal’s way of communicating. This holds true for humans as well, since a recent study found that tonal languages arose in humid climates where conditions facilitate the larynx’s ability to produce different tones. While the “l” word, language, is still not applied to chimp communications, the new study is grabbing the attention of language experts. “This new study is a striking, and surprising, demonstration that at least one part of this uniquely human ability is present in our close primate relatives. The sound of chimps’ referentially meaningful calls really does seem to be shaped by social learning,” he continues.